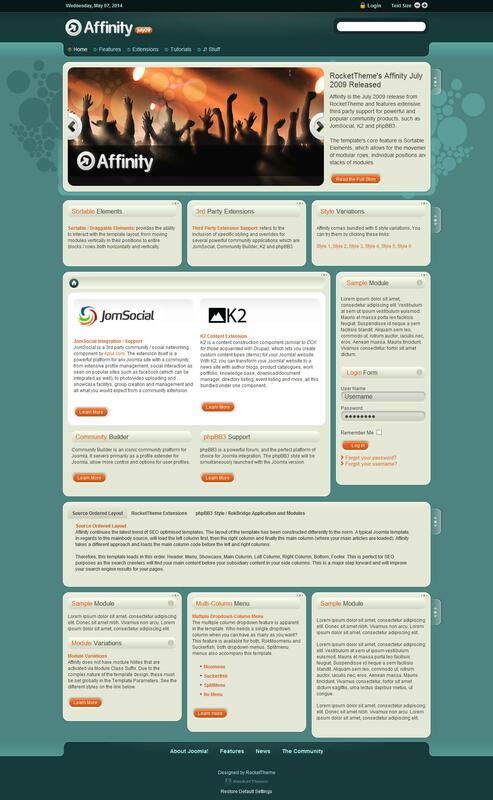 RT Affinity - excellent business template for Joomla CMS from the professional design studio RocketTheme. Original design template, designed with all the modern requirements, perfect for creating a company's website. The template is pre-installed 35 module positions, 6 styles, as well as added support for extensions K2 and JomSocial. The advantages of the template should include support for most extensions studio Rockettheme, with which you can customize the desired functionality. Pattern characteristic of fast downloading speed, excellent optimization, support for mobile devices and all browsers.